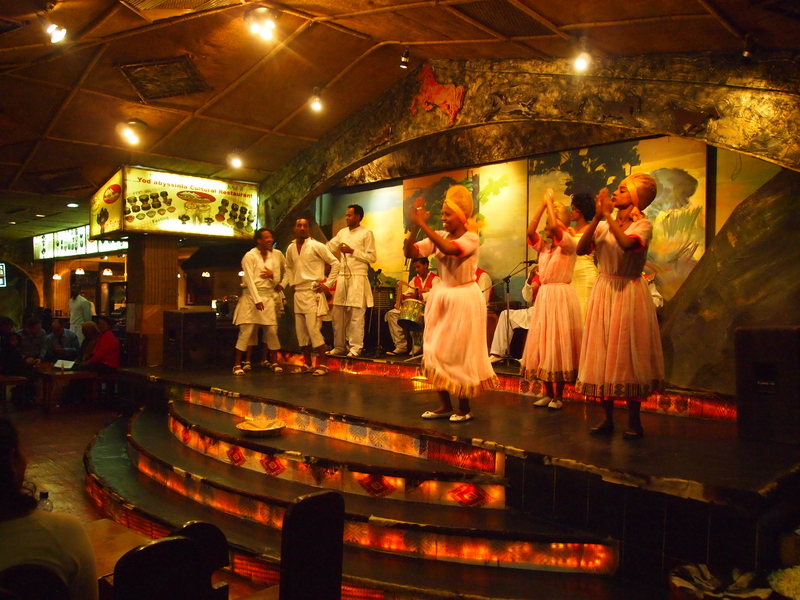 Thursday, October 25: Once Ed returns home from work, we head out shortly to Yod Abyssinia, an authentic Ethiopian restaurant that serves foods from the various ethnic groups in the country. 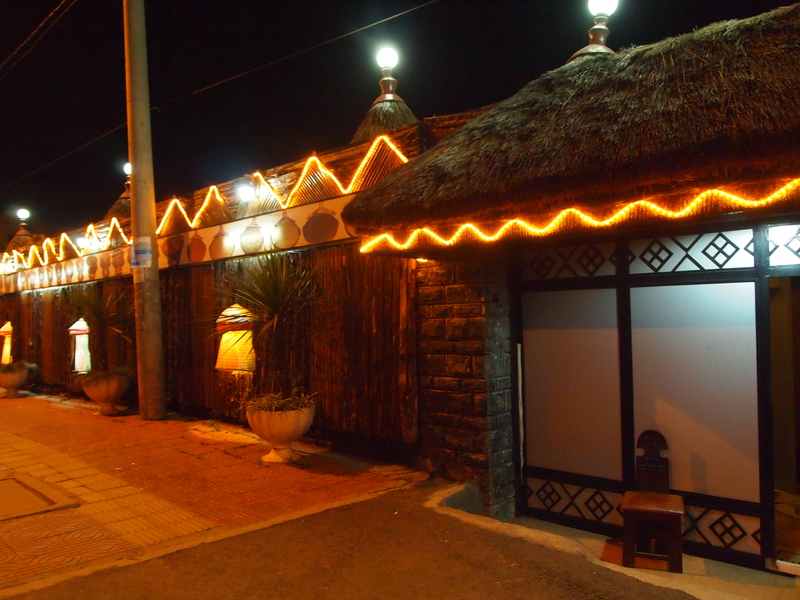 According to the restaurant’s website (Yod Abyssinia Cultural Restaurant): ‘YOD’ means ‘witness or speak out’ in the Gurage ethnic group where the owner, Ato Tizazu Kore, is originally from. And ‘Abyssinia’ is the ancient name of Ethiopia and the region known today as the Horn of Africa. We walk in the dark past the international school where Ed’s sons attended school last year when they were living with him. Now they have returned to the USA for his second year. The night air is cool and crisp. The neighborhood’s middle class houses stand silently around us, bounded by concrete walls topped with curled barbed wire. Many houses have round-the-clock guards sitting in little guard houses within the gates. This place is definitely where the well-off live. 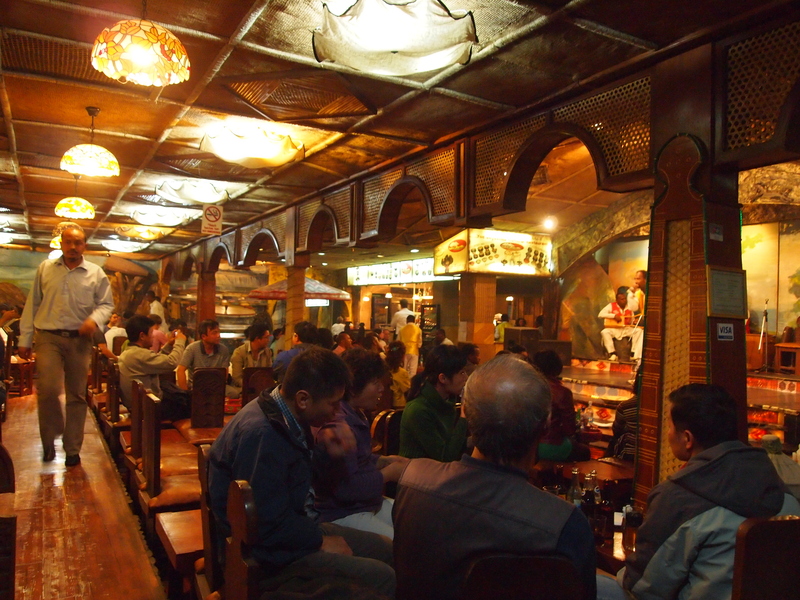 We arrive at the restaurant, which is packed with people of every nationality. Especially evident, and surprising to me, are the Chinese. Apparently, the Chinese have numerous building projects in Ethiopia, including a ring road around Addis Ababa. In January of this year, a new Chinese-built African Union headquarters opened its doors; it’s a towering $200-million complex that has been called “China’s gift to Africa.” The new AU headquarters, a 20-story tower, is Addis Ababa’s tallest building. Chinese contractors also built the 300 MW Tekeze hydroelectric dam in Ethiopia which, at 185 meters high, is one of Africa’s tallest dams. After the World Bank and many other banks declined to get involved in the Gibe III Dam on the Omo River, China’s biggest bank approved a loan of $500 million for a Chinese equipment contract for the project. 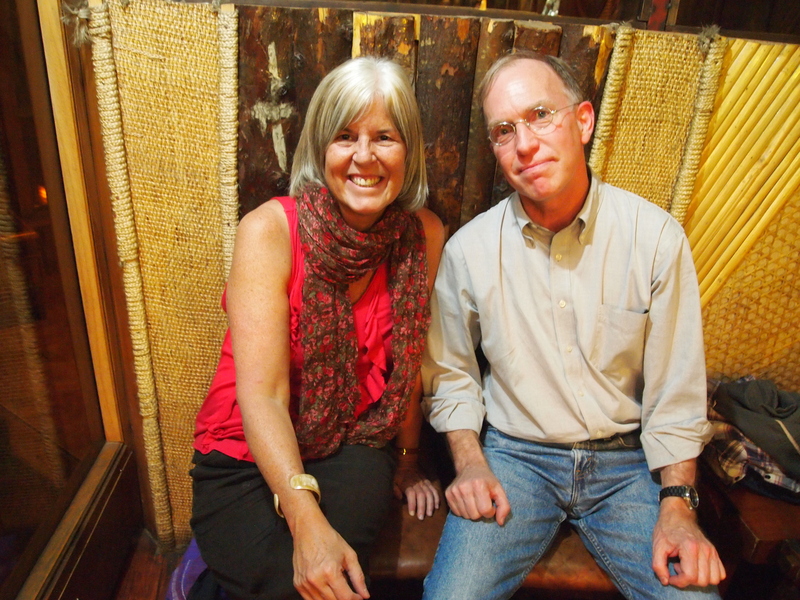 Gibe III will have devastating social and environmental impacts on the Lower Omo Valley and the Lake Turkana region, according to International Rivers, an NGO based in California. 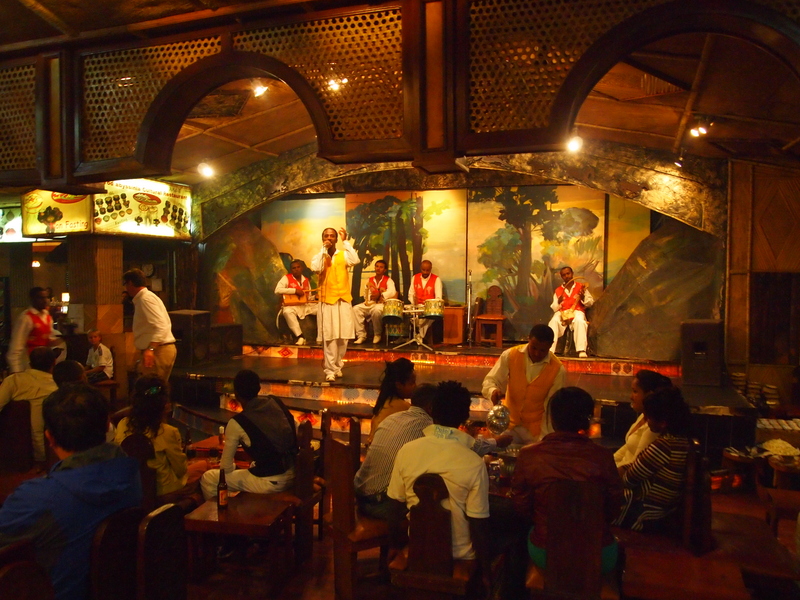 We arrive at the restaurant in the middle of song and dance performances by Ethiopia’s various ethnic groups. 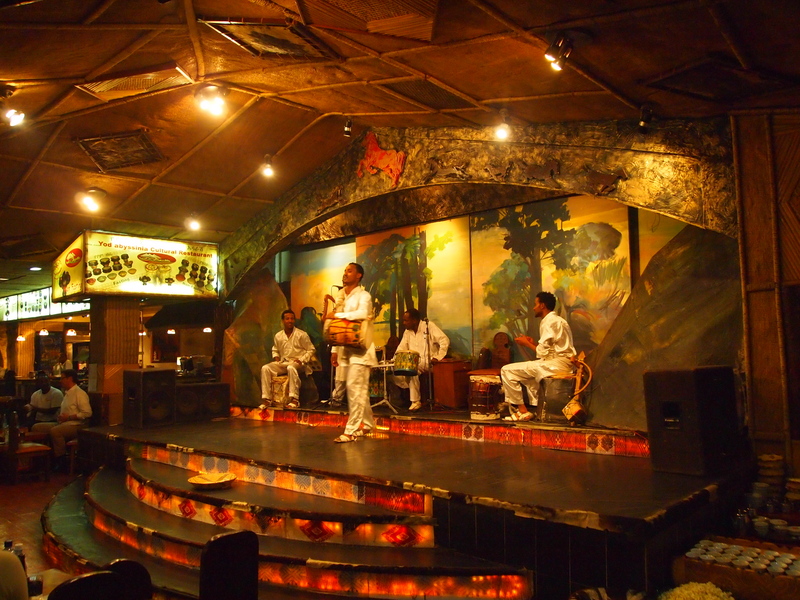 The Oromo, the Tigrigna, Gurage, the Amhara and other Ethiopian ethnic groups’ dances and music are included in the nightly live performance. 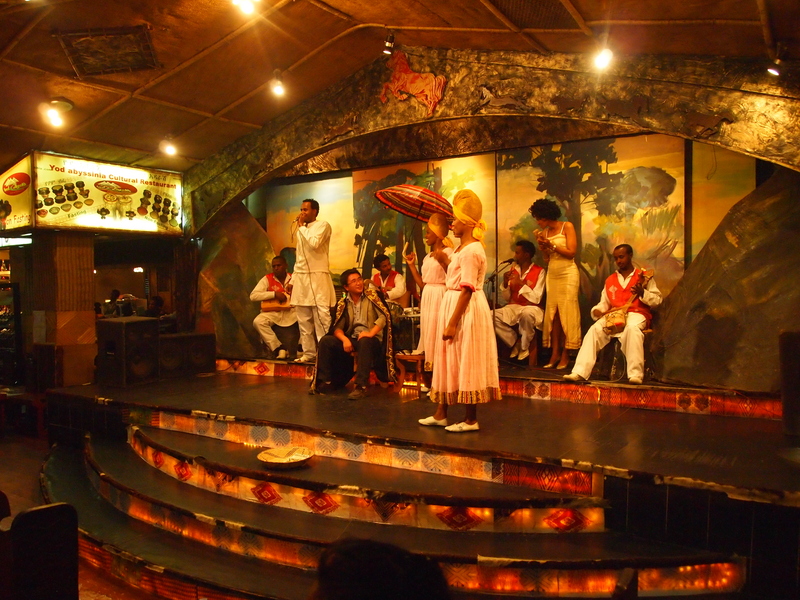 The performance is energetic and lively and the music has a fun African beat. Some of the dancers move so fast, their arms and legs look like a blur. 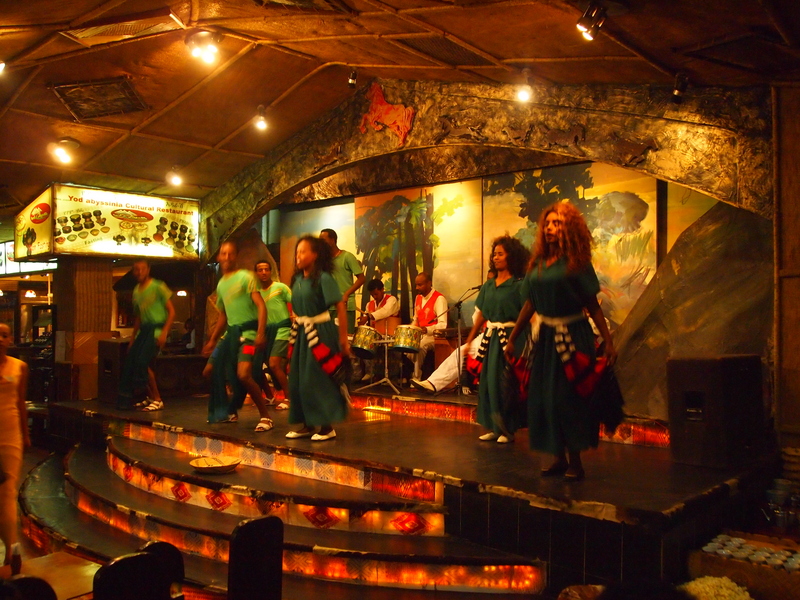 In one of the dances, the men dancers move the tops of their bodies and shoulders in a distinct “Ethiopian” way. At one point the performers pull one of the Chinese men to the stage and place a royal robe around his shoulders and a crown on his head. I guess the Chinese are royalty in Ethiopia now! 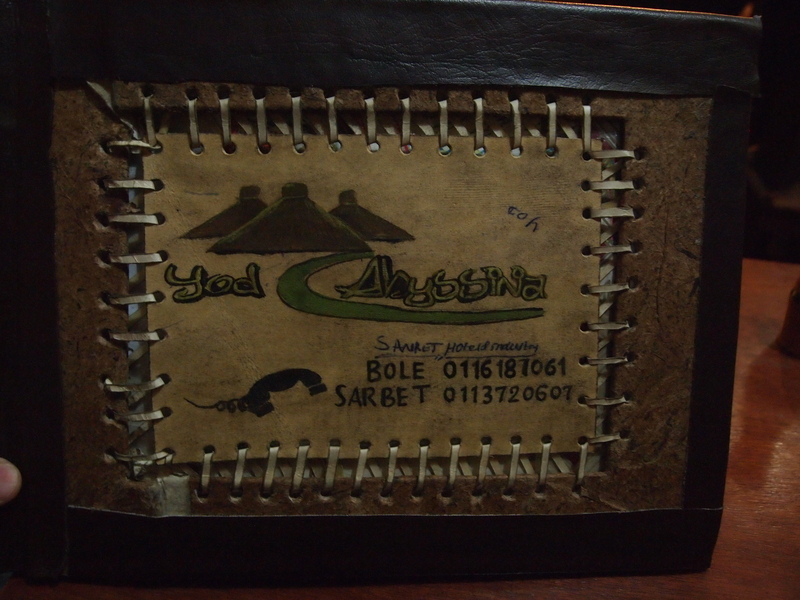 Yod Abyssinia serves more than 35 varieties of local dishes comprising fasting food (made of array of vegetables) and non-fasting foods (meats). Various type of wat, or stew, from beef and lamb, doro wot (spicy chicken stew, a rare delicacy in Ethiopia), and tibs, roasted meat, are on the menu. Also offered is kitfo, minced beef or lamb like the French steak tartare, usually served warm, but not cooked, in butter, berbere, the famous Ethiopian red powder made of as many as 16 spices, and sometimes thyme. 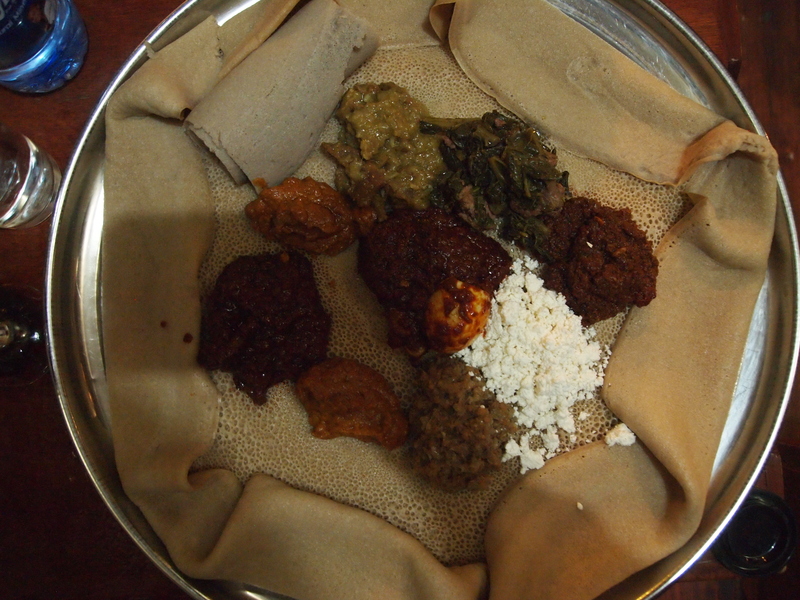 All of these stews and sauces are served on injera, a spongy pancake made of a local grain called tef. We order a sample of all of the above, except the raw meat kitfo, as well as messer, a lentil curry made with onions, chilies and various spices, and a kaledish. 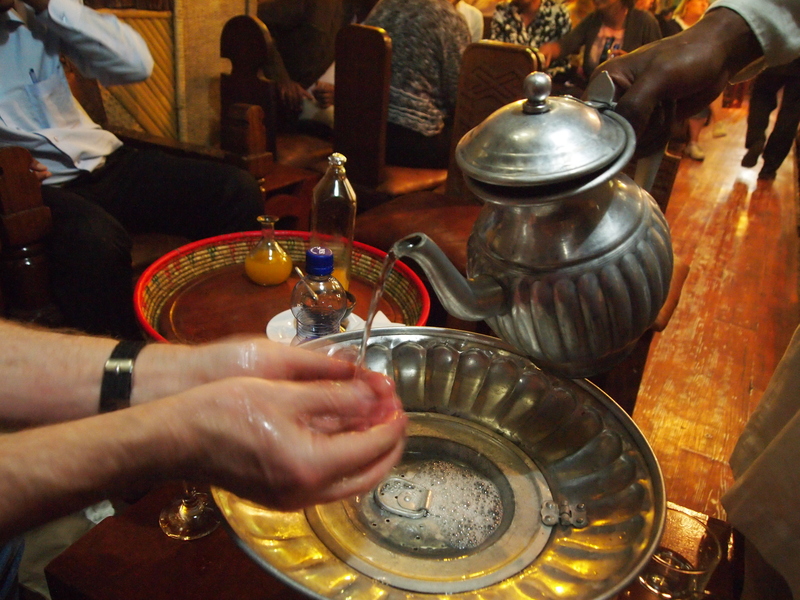 An Ethiopian man comes by with a silver pitcher, from which he pours water over our hands into a bowl. Voila! Our hands are clean. 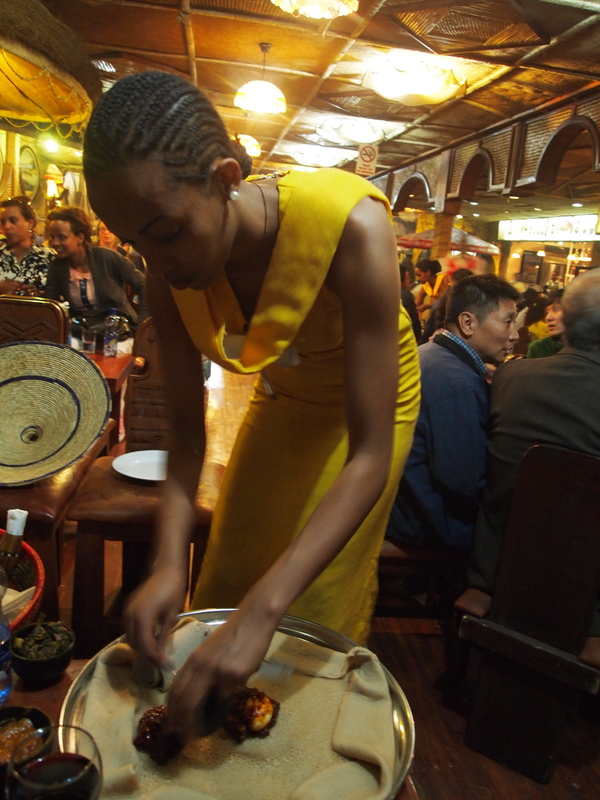 Then an Ethiopian waitress, wearing a traditional yellow dress, spoons the various wat dishes onto a platter of the sponge-like injera. In addition, we’re served up neat rolls of injera that look like napkin rolls. We tear the injera into pieces and use the bread as a kind of utensil to pick up bites of the various dishes. They are delicious! This is such a fun evening for my birthday! It makes up for my long day of waiting around & doing nothing. The meal is Ed’s treat and when we return to his house, he serves up a piece of banana bread with a candle on it. Luckily I don’t have trouble blowing out the one candle, which would be quite pathetic! He gives me a sweet gift of a delicate monkey necklace made of coconut shell that he picked up on a recent trip to Rodrigues Island in Mauritius. 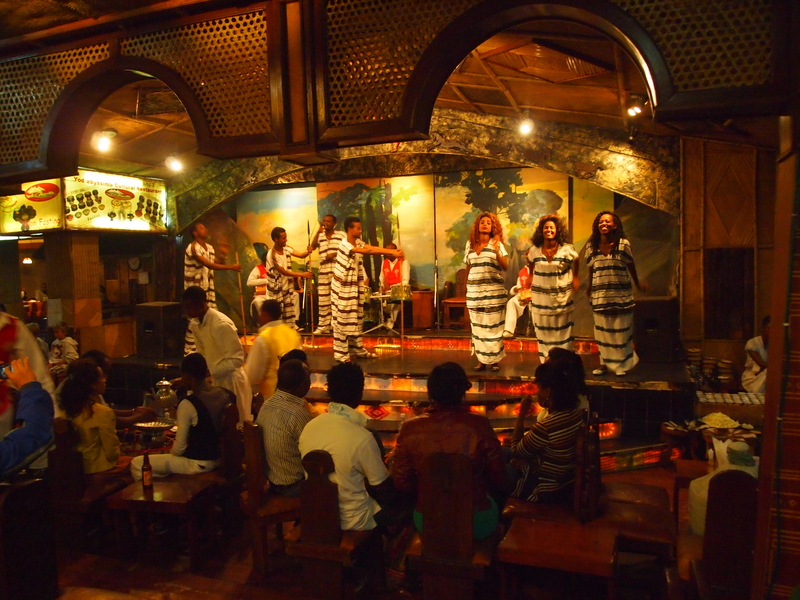 Here are some clips of the live performance if you’d like to watch the Ethiopian dancers in action!